For many new skiers the idea of mastering carving ski technique is akin to finding the holy grail. Indeed, the subtleties and nuances of the carved parallel turn can pose a challenge to beginners. Fortunately, advanced equipment design, as well as cutting-edge teaching techniques have made carving ski technique an attainable skill. In fact, the combination of equipment, progressive teaching methods and sport-specific ski fitness programs have significantly shortened the carved turn learning curve. When shaped skis were first invented, the carved turn became a realistic goal for even less than athletic novices. Today, shaped skis are the only type of skis you will find in a ski shop. However, occasionally a new skier will come to his or her first lesson carrying a pair of 200 centimeter skis that have been borrowed from a well-meaning mom or dad. Since these skis have only a minimal amount of sidecut, they will hinder the learning process. For optimal carving, your skis must also be the correct length for your height and weight, and have the appropriate flex for your skills and strength. 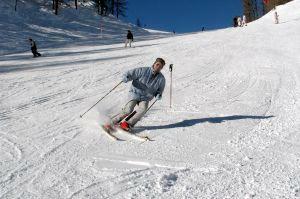 A ski that is too long will cause you to initiate your turns by pushing out the tails of the ski. An overly stiff ski will cause you to "muscle" your turns. While selecting the right ski is crucial to carving ski technique, many instructors believe that boot choice is even more important. Beginners usually choose soft and comfortable ski boots. This is great for learning the sport. However, as you progress, you will need boots that are more supportive. On the other hand, if your boots are too stiff, you might not be strong enough to get them on edge. Despite your best efforts, you might end up skidding, as opposed to carving, your turns. Many people have structural imbalances in their feet, which may impede their ability to perform a carved turn. Certain misalignments of the knees may prevent your feet from staying parallel. For example, if you find that despite your best efforts, you still find yourself in a wedge, or pizza-shaped, foot alignment, this might be a pertinent issue. If you are serious about progressing your carving technique, consider engaging the services of a boot-fitter and alignment specialist. These professionals can insert materials into your boots which can compensate for imbalances. Carved turns have very little to do with muscle power. In fact, using less force will create smooth and fluid turns. Carved turns are initiated in the feet and ankles, not in the upper body. By using a subtle ankle movement to tip the ski on to its edge, the sidecut of a shaped ski will practically cause the ski to turn itself. Carved parallel turns are performed by rhythmically shifting your weight from one ski to the other. For best results, this rhythm should be fluid and even. Prior to attempting them on the slopes, you might want to practice carving technique at home. Take off your shoes and stand tall. Place your feet about hip-width apart. Lift your right big toe and allow your weight to shift on to your right little and your left big toe. Return your right big toe to the floor and allow your weight to shift back to center. Perform the same movement with your left big toe. Create a rhythmic movement pattern, gradually shifting your weight from right to left. Start with your body facing across the hill. Flex your knees and shift your weight to your right little toe. Simultaneously, point your right knee to your right. Straighten your legs and allow both feet to flatten. Do the same thing on the left foot. The carved parallel turn may be a challenge, but it is well worth your efforts.